Your wrist has been put in a cast to stop it from moving so the bones can heal properly. Because of your injury, your arm might swell, your wrist joints might become stiff and your muscles might become weak. This page explains how you can minimise the effects of your injury. You should gradually feel less pain and discomfort. The Emergency Department, Grey Base Hospital, on (03) 769‑7400. Or the Emergency Department, Buller Hospital, on (03) 788-9030. If you've been given a sling, wear it only for the first one or two days. If you use a sling longer, your shoulder and elbow can get stiff and difficult to move. You can help to reduce the swelling by raising your arm. To do this, rest your hand on the opposite shoulder, or rest your arm on a pillow. Avoid getting the cast wet by wrapping your arm in a plastic bag whenever you're in contact with water (while you're having a shower, for example). You can still do many household activities while you're in a cast, for example, folding the laundry. 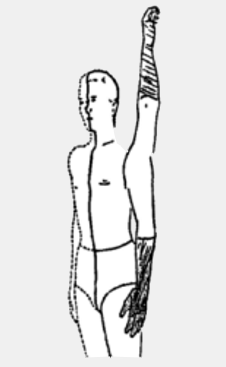 Continue moving your arm gently so that it stays mobile. The following exercises are important and will help to reduce swelling and prevent stiffness and weakness. Do them four times a day. 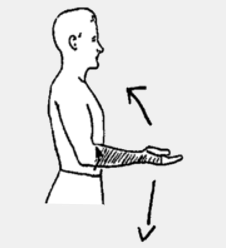 You won't be able to do exercises 1 and 2 if your cast is above your elbow. Stretch your whole arm above your head. Hold this for five seconds. Fully bend and straighten your elbow. 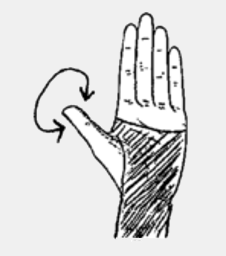 Fully clench your fingers to your palm or cast. Make sure all three joints of each finger are bent. 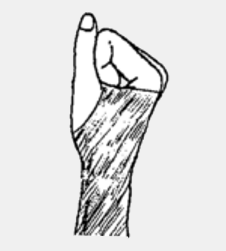 Rotate your thumb in all directions, as far as you can within your cast.